Do you love tips and shortcuts? I know I do! If I can learn something that makes my life easier, I'm all over it. Vintage Beads - Do you ever wish you could find more of a special vintage bead? Try making a copy out of polymer clay! Click here to learn how to make a polymer clay mold of your bead and how to make polymer clay copies. How to Make an Adjustable Necklace Clasp - John D. shares how he solved a potentially pricy problem with a simple solution. Designing with Focal Beads - Simplicity is always your best way to go to show off a gorgeous focal bead. You want to showcase a focal bead, not strangle it. Try stringing it alone on a cord or chain, or with couple of complementary beads. Furry Hemp Twine - Beeswax is a great conditioner for taming fuzzy twine. You can get beeswax from jewelry supply, craft, and sewing stores. To condition your twine, hold the beeswax firmly in one hand while pulling the length of twine along it. Run the twine a few times to lay a thin film of wax. The furriness should be a lot less noticeable now. Colored Hemp - The dying process makes colored hemp less durable and more prone to breakage than natural hemp. For longer lasting jewelry, always use natural hemp in conjunction with the more fragile colored hemp. Hemp Jewelry Care - Wearing hemp in the shower or while swimming will greatly shorten the life of your hemp jewelry. I found this out the hard way! Your hemp jewelry will last a lot longer if you take care not to get it wet. Oxidizing with an Egg? - You might be surprised to know that you can antique your sterling silver jewelry with an egg! Chop up a boiled egg and place it in a baggie with your silver for a few hours or until the silver has darkened to your liking. It will turn yellow yellow then pinkish purplish bluish, then greyish blackish. Wash off the silver with soapy water, rinse and you are ready to go. Why does this work? The sulphur in the egg yolk causes the reaction. Don't freak out because your jewellery or wire has turned black if you do this! This is a good thing. Just shine it up with some steel wool and/or a polishing cloth. This technique is not very cost-effective in quantity but is great in a pinch. Making Bead Holes in Soft Clay - Try using a sharp wooden skewer. Push the skewer into the bead until it makes a tiny dimple on the other side, but don't push it all the way through. Remove your skewer, then gently push it into the dimple you made, until your skewer comes out the other side. Voila! Doing it this two-step way, rather than pushing all the way through once, makes a nicer hole, and your bead is less likely to get distorted. The thinner the wire, the quicker it will ball up. Very short pieces of wire take longer to ball up (or won't ball up at all). The closer your pliers get to the flame, the more likely it will be that your pliers become a heat-sink, absorbing the heat of the flame before the wire gets hot enough to melt into a ball. "Here's a little tip I found for polishing up those balled headpins - citric acid pickle. Super easy to make, and environmentally friendly. I got my citric acid at the Bulk Barn (I actually use it when I make some types of jams instead of lemon juice). The recipe I followed was 1 part citric acid crystals to 10 parts water (I did 1/2 tsp citric to 5 tsp water - just enough for a few headpins). Mix in a glass bowl (do not use metal - glass or ceramic or enamel only) and heated up in the microwave until it boiled (~30 seconds) then tossed the headpins in. It took about 10 minutes to get rid of the fire scale. The pins turned a bit white where they had been blackened and then I polished them up with fine steel wool - voila shiny headpins." Practice Wire - New to wire work? Sterling silver wire is lovely to work with, but unless you're made of money, don't use it to practice with. Use inexpensive craft wire or copper wire from the hardware store instead. Ugly, Misshapen Loops? - Practice makes perfect! The first time you try to make loops using round-nosed pliers your work will probably be an ugly and misshapen. Everyone makes ugly misshapen things at first. Don't get discouraged. Just keep practicing. Use cheapie wire like copper or craft wire to practice with. You do not want to waste your expensive sterling until you become good at rounding the loops properly. Always remember to use a light touch when gripping the wire with your round-nosed pliers so you don't mar it too much. Tip for tucking down little end pieces of wire - If you have crimping pliers, they are perfect for squooshing down the little bend of wire when making a super basic wire headpin or pressing down the end of a wire after making a wrapped eyepin or beadlink. Always bend the wire by using your FINGERS (usually the thumb) to press the wires against the or around the jaw of the pliers, rather than bend with the pliers. Why? If you use the pliers to do your bending, you'll get more plier-jaw shaped dents than are necessary. Try to keep the pliers as stationary as possible and you'll get better results. This is true not just for making loops, but for manipulating the wire in any way. Opening and Closing Loops, Links, and Jumprings - Always use a twisting motion with your plier holding hand (like twisting a doorknob) to open links, loops, and jump rings. If you pull the loop "out", you'll never be able to twist it back into shape. In an "emergency", a pair of nail clippers will work *great* as wire cutters for gold fill or sterling/fine silver wire (not ~too~ large), and you can get in really close. Just don't try to use them again on your nails, as the wire dulls the clipper blades fast! More awesome-possum wire working tips can be found here. If you go to a welding supply store you can buy .9 MM (20 gauge) alloy 4043 aluminum wire in a spool of 1 pound at $9 US and make hypoallergenic ear wires. They work just like sterling silver and look the same but are so light. 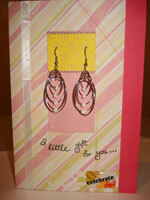 Jewelry Gift Card Idea: Fion of Making-Birthday-Cards submitted this great tip. Why not combine a card and gift in one? Want to make a jewelry gift birthday card like this one too? Click here to learn the know-how at Making-Birthday-Cards.com. The Pre-Gifting Jewelry Test: Thinking of giving jewelry as a gift? Wear the jewelry for a day. You'll see if it hangs properly and feels comfortable, if your workmanship seems durable, and if clasps stay closed. Do you have a tip to share? Click here to send it to me! I'll put it up on this website and mention it on my blog too. Getting high-quality, relevant links like this is one of the best ways to boost traffic to your website. So, if your tip gets published, I'll link to your website or Etsy shop. If you send in more than one useful tip, each tip will have your link. So more tips published means more valuable links to your site! Of course, you don't have to submit a website link. Please don't feel you need to have a website to submit a tip!